4 part series published in Lamar University Press on evolving role of stem cell therapy in American medicine. Reported by Chelsea Henderson, named University Press editor at Lamar University in 2012, where her work has earned Excellence in Media awards. Chelsea has done a remarkable job of investigative reporting over the the past year on stem cell therapy. Interviews covered all stakeholders, including patients like PFSC members Claire Hooper and SammyJo Wilkinson, to explore the controversy that has arisen following the FDA’s determination that patients cannot utilize their own stem cells in the U.S., forcing them to resort to medical tourism abroad. Chelsea also tracked down regulators, doctors and scientific experts, to examine the scientific facts, and the restrictive regulations that no-option patients see as a death sentence. The different types of stem cells are explained in clear language and illuminating graphics, starting with embryonic and man-made engineered induced pluripotent stem cells, which haven’t even entered human trials yet. Then autologous adult stem cells are examined, which have been in use for many years. The patient interviews she conducted reveal recoveries from conditions like multiples sclerosis and cerebral palsy, with positive results these patients had never been able to obtain with traditional medicine. These reports represent the balanced reporting that Patients For Stem Cells has found to be lacking in much of the press stories on stem cells. This series stands as a comprehensive primer for anyone who needs to come up to speed on this important topic. PFSC How did this story come about, what caught your interest? CH I began researching stem cells after my boss told me about his friend, an artist and Lamar University graduate, who was raising funds for stem cell treatment during the summer of 2012. She had multiple sclerosis, which I knew nothing about, so I wanted to educate myself about her disease, as well as how stem cells could be used as treatment. At this point in time, my research was only supposed to prepare me for that one article. But the more I discovered, the more gaps I found in the research and the less things made sense. I couldn’t understand how the scientific community could present the full potential of stem cells, there were patients all across the globe who were more than willing to use their own cells to heal their degenerating bodies, and somehow, the FDA had banned patients from doing so. That’s how my one story about an artist with MS turned into a two-piece story package and a four-part series. PFSC What surprised you the most in your discovery research on stem cells? PFSC When I began researching stem cells a year and a half ago, everything was new to me. I had no prior knowledge going in – I had never even heard of stem cells before. Once I became more educated, I was infuriated by how stem cells are regulated in the United States. The most surprising thing, however, was how the Food and Drug Administration handles inquiries about stem cells. Heidi Rebello, FDA Office of Media Affairs’ deputy director of operations, was the only FDA representative out of the 18 I contacted who agreed to answer my questions. Even then, all she did was paraphrase parts of the Code of Federal Regulations and send me a link to the full text. It was frustrating and complicated, and the only thing I could think during that lengthy process was, “Wow. If they’re making me jump through this many hoops just for some information, how are they treating sick patients who just want access to use their own cells?” This made me push even harder, and really helped turn writing this series into a civil rights issue. PFSC Do you think you yourself will bank your stem cells, as insurance for future medical use? CH I would love to bank my stem cells for future medical use. Without insurance coverage of such a procedure or any extra funds to speak of, however, this security is not an option for me at this time. If I ever needed to use my own stem cells, I would have to raise funds in order to travel abroad. I, like so many suffering Americans today, would be forced to engage in medical tourism just to access my own cells. PFSC Knowing what you know now about the FDA regulations of our stem cells, do you agree or disagree with those regulations? CH I absolutely disagree with how autologous stem cells are regulated. I understand why embryonic and induced pluripotent stem cells are regulated the way they are, and the FDA is 100 percent correct in doing so. However, I see no reason for the FDA to regulate autologous stem cells they way it does. The only danger I can see in using autologous stem cells is in mixing them with potentially harmful substances. But after interviewing stem cell patients, I am confident in saying that the ones that want to use their own stem cells – not embryonic or induced pluripotent – do not want a stem cell cocktail. 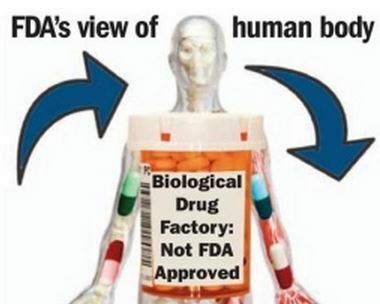 They want to use their cells, and I see no reason for the FDA to interfere with that. To help spread awareness, share this post by clicking the share buttons below. This entry was posted in Balanced Journalism, Education on 12/02/2013 by patients.